This head on a platter Halloween cake idea is fun and easy to make. I am by no means a professional cake decorator at all! I had to find something in my kitchen to bake the size and shape I wanted for this cake. I couldn’t believe it but deep in my cabinets I found a metal bundt shaped Jello mold with no hole in the middle… just the right size! It’s the only rounded thing I had in the size I wanted the head to be. I baked two cakes using this jello mold. After cooling, I filled, stacked and crumb coated the cakes. I carved out indentations for the eyes and mouth and iced them with black frosting. After the icing set a little, then the fun begins! Get whatever tools you would like to shape and form your head. I used a butter knife, spoons, toothpicks, an offset spatula and smooth paper towels (to smooth the icing in certain places). I shaped his forehead, nose, cheekbones and ears out of buttercream just by pushing and shaping the buttercream icing. That’s what is so fun about making this cake. He doesn’t have to be perfect. Shape and form him any way you would like and have fun doing it! I stuck gummy candy eyeballs in his eyes and piped a thin line around his eyes and played with the icing until I got the look I liked. Then came greenish yellow fondant teeth and another piped line around his mouth to distinguish his lips. I piped on purple/gray eyebrows and hair. 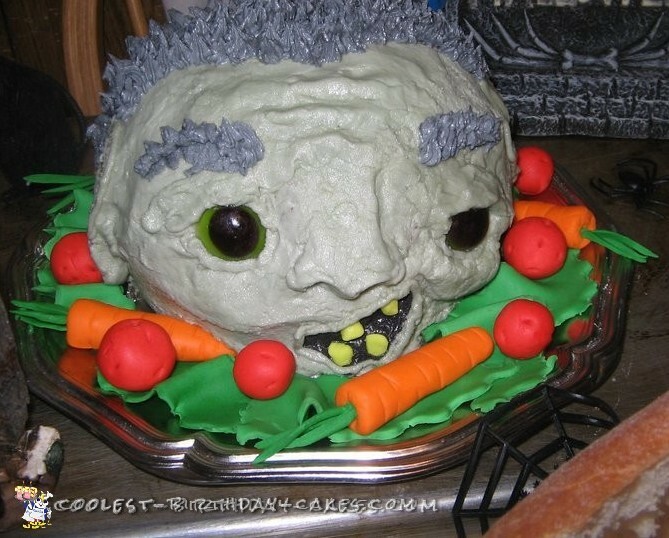 I made homemade fondant veggies and lettuce and placed them all on a Dollar Tree silver platter and placed a clear domed shape on the bottom bowl turned upside down over it all. I love him! What a fun and easy cake to do! I have made a few different looks with this cake. Each one has its own look. Hope you enjoy this cake!